WHAT?? Legal For Bike Riders To Run Traffic Lights? We constantly hear and read complaints from drivers: “Bike riders don’t obey the law!” “Bike riders think they are entitled to run stop signs!” You might be surprised to learn that it’s legal—and the reasoning will help you understand how we can build our places better for everyone. Important takeaway: Bike riders are not cars. They are people. 5. No, most cyclists don’t want to be “treated like cars.” They want to be treated like humans. Bicycles are not cars. They don’t move like cars, take up the same amount of space as cars, or operate at the same speed as cars. It doesn’t make sense to pretend otherwise, and consequently, it doesn’t make sense to apply all auto-oriented traffic laws to cyclists. As described earlier, while laws like the Idaho Stop may seem counterintuitive, they can actually decrease collisions. So can installing bicycle-specific lights, such as those in Paris. Most cyclists I know, myself included, have no wish to “be treated like cars.” We want to be treated like people. We mostly would like to operate and occupy space on the road without our lives being threatened. This one is admittedly more anecdotal. But everything from my personal conversations with friends and family about cycling, to the conversation on my local radio shows, to every comment I’ve ever read on an article about cycling—hones in on this one thing. 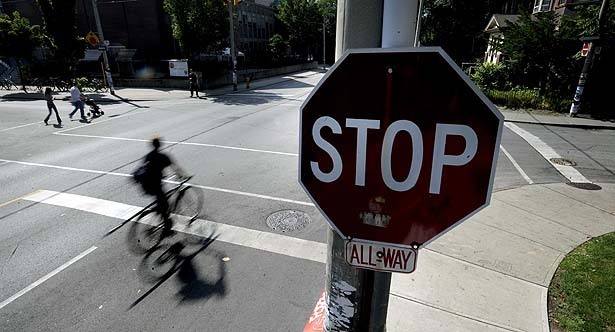 It always comes back to that one time you saw a cyclist running a light, running a stop sign, not wearing a helmet, or committing some other unforgivable sin on the street that only seems unforgivable when a cyclist does it. I’ve literally had this conversation on the patio of a coffee shop while watching seven cars roll the stop sign outside within a matter of minutes. Motorists commit traffic infractions and do it often. I have never heard this used in a conversation about the viability of cars on the road. So the question becomes: why is this so often used in the conversation about the viability of bikes? I don’t have control over other cyclists on the road. Some of them break laws or don’t signal correctly. Sometimes drivers assume cyclists have broken laws when actually they haven’t, as explained above. Both scenarios should be irrelevant to the conversation about creating better bike infrastructure.